The 12th January 2016 marks the 9th anniversary of One Financial Markets incorporation. 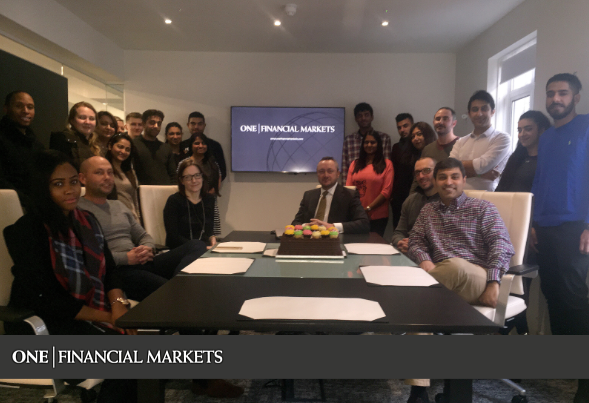 The award winning online broker started life in Hammersmith in 2007 and has since grown to become a global leader in online trading boasting offices in 7 different countries around the world. Many memorable moments in One Financial Markets’ history include their FSA authorisation in July 2007 shortly followed by the recruitment of their Director of trading, Andrew Henderson and most recently the launch of their new offices in Hong Kong and Saudi Arabia. In contrast to the turbulent economic conditions since their launch in 2007, One Financial Markets has gone from strength to strength showing consistent growth each year and is proud to have long standing partner representation across the globe and remain constantly looking at new market regions. One Financial Markets is authorised and regulated by the Financial Conduct Authority (FCA) in the UK and the Financial Services Board in South Africa. The global award-winning online broker provides 24/5 trading facilities to retail and institutional investors in forex and CFDs on indices, commodities, energies, bonds and bullion.